Stefano Merlino, editor, i-xii + 449 pages. ISBN 963 463 1320. Since the first beginning of the crystal chemical study of the inorganic compounds, a simple modular approach was developed, by looking at the crystal structures as built up through the assembling of polyhedral units. This approach was not only useful for a vivid and insightful description of the complex atomic arrangements of natural and synthetic compounds, but, through the use of simple and powerful rules for assembling the polyhedral units, it displayed an extraordinary heuristic power, suggesting reliable models for many complex structural assemblages. The polyhedral approach also laid the basis for meaningful classifications which were applied to all the classes of inorganic compounds. For example, in looking at the large variety of zeolite structures realized in nature or in the laboratory, it clearly appears that nature and man play with a limited number of modules (rings, cages, chains) built up by the connection of the primary units (namely Si04, Al04, or, more rarely, B04, P04, Be04, ... tetrahedra). Once the kind of these modules is clarified, the description of the various structures is reduced to the 'modular play' of enumerating the various ways through which they interconnect, leading to rational classification, simple description and careful prediction. An additional vigorous stimulus to pay due attention to the modular aspects has been given by the wide access of crystal chemists to the new techniques of structural investigation offered by the electron diffraction and even more by the high resolution electron microscopy, which allow the investigation of inhomogeneities, stacking faults, microtwinning, intergrowths, domain structures, namely all those microstructural aspects which are so frequent in inorganic compounds and especially in minerals: new possible structural arrangements, as suggested by a modular approach, may in fact be present as small domains or may be realized at fault or twin boundaries. Under the action of these various spurs the 'modular play' slowly developed into a definite research theme in crystal chemistry and the original ingenious looseness in assembling the building modules was progressively substituted by a more systematic approach with rigorous rules to select the modules and to combine them. The systematic approach previously mentioned is, in all these cases, particularly evident, especially in OD structures, where rigid constraints in the choice of the modules and in their assembling are imposed by strict requirements of symmetry. These rational, systematic approaches now provide us with reliable procedures to effectively deal with modular problems and therefore it seems necessary that these procedures be part of the cultural equipment of every crystal chemist, no matter whether active on natural or synthetic products. 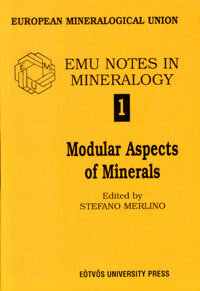 The lectures held at the School on Modular Aspects of Minerals, collected in the five chapters of this volume, have just the aim to show the wide range of modular problems in mineralogy and to indicate the procedures to deal with them.